I wanted to come up with a tangible way to illustrate to our kids that each of the individual stories or accounts in the Bible are linked together into one grand meta-story: the gospel. I talked a bit about this in yesterday’s post. I came up with a simple way to do this that didn’t take much time at all. I describe it here for those who are interested in trying it too. I cut several regular sized pieces of paper into quarters until I had a stack of them. I punched a hole in the top left corner of each, and found a long piece of yellow ribbon. Gold ribbon would have been better, but yellow was the closest I had. Next, I got the boys to the table and gave them one minute to name as many Bible stories as they could. They came up with a mish-mash of random stories that spanned the Bible. I wrote the gist of each story at the bottom of the paper: Noah and the ark, creation, David and Goliath, the wisemen, Jesus on the cross, etc. I gave the boys another couple of minutes to quickly draw a picture to illustrate each story. Then, I had them put them into Biblical chronology. Once this was done, I began to string the individual stories onto the yellow (‘golden’) ribbon. As I did this, I explained that all of these stories are not actually separate stories, but they are all pieces of the big story of the Bible. The stories were all linked together by a golden thread. I asked them to guess what the golden thread was. They came up with very Christian-y sounding answers, but they couldn’t guess what the thread represented. I then explained that the thread was the gospel. I used several of their stories to illustrate this. We were created to be in relationship with God, but sin destroyed this relationship. All throughout the Bible, God was showing Who He was, what He thinks of sin, and that sin had a real and terrible consequence – death and eternal separation from God (aka hell). All throughout the Bible, God builds His plan to deal with the penalty of sin through Jesus’ death and resurrection. 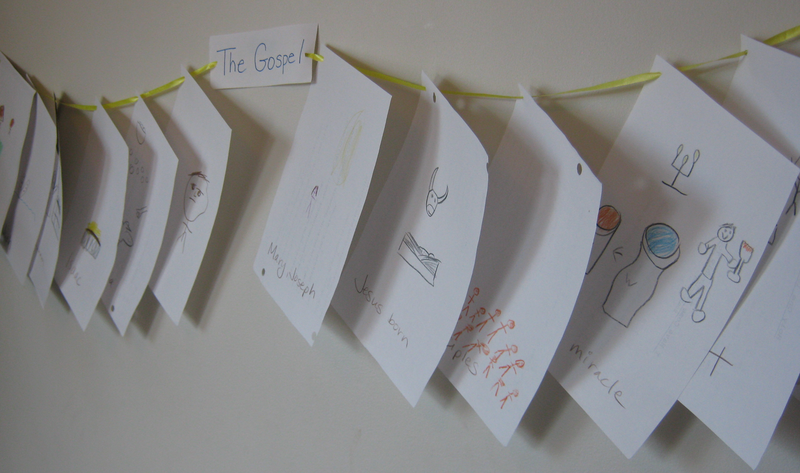 I then taped the two ends of the string to our wall and put a label on the yellow ribbon that said “the Gospel”. Several days later, I quizzed them on the activity (just to see what they had retained!). I asked them to tell me what the golden thread was that held all the stories together (not too hard, they just read my label). Then, I offered a prize (a fancy chocolate) if they could pick four of the stories they had come up with and tell me how they were part of that golden thread. I had to help them a bit, but I was pleased with how well they did! There are probably many ways this activity or lesson could be taught. I’d love to hear from you about how you’ve helped your children understand the meta-narrative of the Bible. Leave a comment or send me an email. Wow! What a great idea. Did they know the order of most of the stories, or did you have to help lots on this? Thanks! They basically did the ordering themselves (although I did question a few of their decisions, which they quickly corrected).